When social services jeopardize her safety condemning her to keep her father’s secret, it’s a glass of spilled milk at the dinner table that forces her to speak about the cruelty she’s been hiding. In her pursuit for safety and justice Brooke battles a broken syst Brooke Nolan is a battered child who makes an anonymous phone call about the escalating brutality in her home. To ask other readers questions about Spilled Milk, please sign up. Ariafh Qureshi Definitely. Based on a true story this book is a boon to today's society. A great help to lost people who have no idea what to do when abused. Does this have any language? Does it describe the abuse to an unnecessary, descriptive amount? Anita Gastaldo Just the right amount to get the story across. 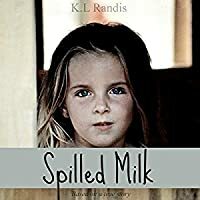 Spilled Milk by K. L. Randis is a touching story based on true events. Brooke Nolan, from the time she is a little girl until her teenage years is sexually abused by her father. She isn't the only target in the family, as her siblings feel his wrath in the form of physical abuse. Her mother is disabled from a mishap at work, and there are 4 children in the household which traps her financially. The perfect setting for the lightning storm that is Brooke's life. It isn't until sitting down to dinn Spilled Milk by K. L. Randis is a touching story based on true events. Brooke Nolan, from the time she is a little girl until her teenage years is sexually abused by her father. She isn't the only target in the family, as her siblings feel his wrath in the form of physical abuse. Her mother is disabled from a mishap at work, and there are 4 children in the household which traps her financially. The perfect setting for the lightning storm that is Brooke's life. It isn't until sitting down to dinner with her boyfriend's family, and his little brother accidentally spills his milk, that she realizes her family isn't normal, nobody screams at the child or raises their hands in anger. Brooke has a difficult time wrapping her mind around the entire incident. The milk mishap is what seems to propel her into seeking help. Brooke builds strong relationships with others, mostly adults who stand by her, giving their full support as she faces the challenge of survival, and court, against her father. The fear she feels echoes through the pages of this compelling story. K.L. Randis illustrations of growing up in a violent home are on the money. Her novel speaks volumes to anyone, especially those who have suffered the devastating effects of abuse. Her words are precise, and descriptive placing the reader front and center in an explosive household. Brooke is an intelligent young woman who finds peace, justice, and most importantly, strength. In my opinion Spilled Milk is about awareness, and reaching out, helping those who can't help themselves. There are far too many stories that mimic Brooke's, characters, and situations may be different, but the fear, and devastation aren’t. Someone in a toxic relationship has to want to be helped, and be willing to come forward. If they know they aren't alone, that support is available, then maybe more will reach out. This is a novel to share with as many people as possible. This was a very compelling story and I could hardly put it down, but it made me so angry. I know this kind of abuse goes on and that children are victimized by their parents, but this child was also victimized by Social Services and her school. How could such agencies promise confidentiality and then do things which put her into further jeopardy? How could a school be so insensitive? But this is a story of a young girl with enormous courage. At times I was hearing the music from "Rocky" while I w This was a very compelling story and I could hardly put it down, but it made me so angry. I know this kind of abuse goes on and that children are victimized by their parents, but this child was also victimized by Social Services and her school. How could such agencies promise confidentiality and then do things which put her into further jeopardy? How could a school be so insensitive? But this is a story of a young girl with enormous courage. At times I was hearing the music from "Rocky" while I was reading. Brooke felt responsible for her siblings and her mother so she tolerated a situation that no child should have to face with the tacit understanding that her father would not sexually abuse her sister. She couldn't protect her family from her father's incredible rage and selfishness, but she could keep it from being any worse. My 15 yo read this and told me I should read it. I was hesitant because of the subject matter but also wanted to be able to discuss with her. It was really hard to read in the beginning but I am glad I pressed on and finished it. A very insightful view of what she went through and how the system "works"...or doesn't work. Unbelievable resiliency displayed throughout this book. Thanks for the courage of the author to write this book. Helen E Bateson Is your 15 year old safe? Was she trying to tell you something??? Sorry my first thoughts!!! This just goes to show just how important proofreading your book is. Seriously..."would OF?" "Oxycontin's?" Not to mention the ungodly number of run-on sentences. I bring this up because I thought this was a fantastic book, and it's a shame I couldn't give it a full 5-star review. Editing is writing 101. Honestly, it is a moving and horrifying tale of bravery and sadness. But if the editing had been more thorough I'd have been able to focus solely on Brooke's voice. Instead, the misused plurals/'s and the disregard for punctuation left me a bit distracted. Proofreading is important. The story is compelling, but the number of run-on sentences and terrible use of punctuation was very distracting. I found myself skimming at the end just to be done with it. This book is nonfiction/true crime. The story is about a girl who is abused by her father. She has the added burden of protecting her younger siblings and taking care of her mom. As she gets older, she realizes that her home life is not right. She gets the ball rolling that will eventually lead to her dad being held accountable. I liked that this book focused on Brooke's strengths. She is a survivor. I also liked that she has been able to bring change to a system that had gaping holes when it ca This book is nonfiction/true crime. The story is about a girl who is abused by her father. She has the added burden of protecting her younger siblings and taking care of her mom. As she gets older, she realizes that her home life is not right. She gets the ball rolling that will eventually lead to her dad being held accountable. Couldn't put it down!! However, it deals with a very sensitive issue that may make this a book that is hard to read for some. This book was absolutely amazing. I feel so much stronger just from reading this book and seeing how Brooke survived. I'm going to dnf this book. My heart just can't take it. Spilled Milk was written by K.L. Randis. She wrote this book to portray her life as a sexually abused child. Although, the main character in the book is named Brooke, the things that happened to her were exactly the things that happened to K.L. Randis when she was a girl. The book is based off of little excerpts from her diary, therefore, the book was written in Long Island, New York and Stroudsburg, Pennsylvania. The setting throughout the book is mostly Stroudsburg, Pennsylvania and Long Island, New York. These are the places where R.L. Randis was raped and molested by her father. Brooklyn (R.L. Randis)- A strong girl that stood up for herself after years of torment from her father. David Nolan- The father of Brooklyn (R.L. Randis) that raped and molested her for years. Molly Nolan- The mother of Brooklyn (R.L. Randis) that was a pill popper and lousy mom. Gina- The women that was there for Brooke whenever she needed her. A huge theme in this book is abuse, because Brooke’s father abused her until she felt like she was worthless. The abuse inflicted onto Brooke was terrible and the book expresses it perfectly. Brooke Nolan is a battered child who makes an anonymous phone call about the escalating brutality in her home. When social services jeopardize her safety condemning her to keep her father’s secret, it’s a glass of spilled milk at the dinner table that forces her to speak about the cruelty she’s been hiding. In her pursuit for safety and justice Brooke battles a broken system that pushes to keep her father in the home. When jury members and a love interest congregate to inspire her to fight, she risks losing the support of family and comes to the realization that some people simply do not want to be saved. Fortunately, she fought through and became the savior of her family. Her coming forward sentenced her dad to up to 16 years in prison. Foreshadowing is one of the literary devices that is used when R.L. Randis said in the first chapter that her brother nearly drowning is the first of the many secrets she kept for her dad. The next literary device used in Spilled Milk, is symbolism. In the book when Brooke realized that when her boyfriend’s brother spilt a glass of milk on the table and their father did not hit or shout at him, Brooke realized that her family was not normal. Heather, a girl that kept Brooke updated on the case and any other court information, said this when Brooke was beginning to feel like there was no hope winning the case against her father. Fortunately, Heather said just a few words that reassured Brooke that she needed to do this for herself and for other victims. This is the narrator speaking after David was convicted for his crimes. It is explaining the excitement that Brooklyn felt when she was set free from her abusive father. I picked this book to primarily understand what can go in a sexually abused person's life and for that purpose, this book does have some new and interesting insights. But, the narration style was lacking. I’m not sure why this book has such good reviews. The story is compelling but the writing is painful. The dialog was unreadable, especially the counselor, Midge. I think I’ve had enough of Kindle Unlimited self-published books. What ?????? Really sad story, not written well, extremely confusing characters. Do not recommend this book at all. Didn't even finish the last chapters. Cover aside (because well, it’s not the prettiest), Spilled Milk was one of the most compelling books I have read to this date. Spilled Milk shows you the inside of so many things that go on in this world every single day. And through Brooke’s POV, we see the details on how it can destroy a family and cause so much turmoil that they think there is no way to come back from it. The book itself was very well written. It was poignant and sad but at the same time chilling and impactful to all. Not only was Brooke’s story heartbreaking, there are so many secondary characters that are heartbroken too. Seeing that, especially from Brooke’s perspective was terrifying. Especially knowing that these types of things happen to children every day. Including the injustices that come their way. I LOVE how the title came to play within the story line. The metaphor it was used as could not have been executed any better than what the author did. The way Brooke rises from the ashes but falls all the same was incredible. Her journey is not for the faint of heart but I’m so glad I braved it and journeyed with her. This is one of those books I will think about as time passes by. It touched me in a way that I wasn’t expecting and puts so many things into perspective to me that I wasn’t aware of before reading Spilled Milk. Everybody needs to read this book. Whether you have went through abuse or not. I think we can all take something away from this book. As much as the content is disturbing, and as much as I do not understand the 'moniker'- 'based on true events', this is a very solid write. The story is detailed to the point that it becomes painful- but that is because of the subject matter and nothing else. Thankfully the book itself is not written in the 'graphic sense', that only will come from the readers individual mind, yet that is difficult enough to process. I especially liked the way the title itself has been worked into the story the wa As much as the content is disturbing, and as much as I do not understand the 'moniker'- 'based on true events', this is a very solid write. The story is detailed to the point that it becomes painful- but that is because of the subject matter and nothing else. I especially liked the way the title itself has been worked into the story the way it has- the reasoning for the title itself if you will. Something usually only seen in the movies- when the main character refers to the movie title in his lines. This story was amazing. It’s very sad what she experienced in life but her story of over coming all of these terrible things is beautiful. I cried a couple times and felt all the feels for her. My heart goes out to all those in the world that has experienced sexual abuse, especially as a child. I can’t even begin to imagine how terrible it is. All in all I loved her journey and the ending of her story. She is an incredibly brave woman. Loved this book!!! I couldn't put this book down from how good it was. What a heartbreaking, incredible story! I love how the spilled milk on the dinner table inspired Brooke to speak out. This book made me love books that are based on a true story. Moving story. A memoir about someone who made it through a horrific childhood and became an incredible, strong adult. My favorite kind of book. Wonderful book!!! Tough subject matter. It was hard to put down. The writing and editing is not great, but the story was very compelling. Quite heartbreaking... I'm going to have to come back with the review for this one! Based off a true story, K.L. Randis writes a dark, touching and well-written novel accurately depicting domestic violence, pedophilia and negligence. The story starts at a seemingly light tone, with a hint of darkness lurking in the corner. Eventually, the true extent of the tragedy our main character has to live with is shown, and with that the reader understands what they main character is going through, which builds their ability to empathize with the victim, not just sympathize. I cannot emphasize how well-written this story is, using enough descriptions to get the story across without seeming extra. Knowing people that have to deal with similar situations, this story proved an eye-opener to see what it was like from their side, to live under constant fear. Recommending this book is a tricky task. On one hand it details pedophilia, which is an extremely dark topic and very uncomfortable to discuss. On the other hand, the book is an eye opener into why victims of domestic violence do not speak up/ can not speak up. This novel presents a real-life issue, one that needs to be solved. The only reason the main character realized the predicament she was in was due to spilled milk. We cannot rely on such chances, and must take matters into our own hands. Many ways have already been proposed, we just need to back one and push it. This is a super dark story about child molestation. The darkest I’ve read. I was devastated, I was raging, I was sickened but the most powerful lesson I took away: I was profoundly educated. Yup, I cried for her numerous family betrayals and for the very few angels that stood by her. The aftermath of reading this book is that it had a restrained & imperceptible agenda vs an agenda that is forced down my throat. I appreciated the authors sense of writing HER story (as well as representing oth This is a super dark story about child molestation. The darkest I’ve read. I was devastated, I was raging, I was sickened but the most powerful lesson I took away: I was profoundly educated. Yup, I cried for her numerous family betrayals and for the very few angels that stood by her. The aftermath of reading this book is that it had a restrained & imperceptible agenda vs an agenda that is forced down my throat. I appreciated the authors sense of writing HER story (as well as representing other victims). She did not use overtly luridness in writing this shocking tale. I walked away with a so much more compassion & empathy of how some victims weave their protective cocoons to JUST LIVE ANOTHER DAY while being horribly abused. I was encouraged that some victims have super resiliency tendencies. A Must read in my opinion – tho, I’m sure some people will have triggers reading the novel. It took me a long time to digest her story - not because she used shock value but because she told her truth in as delicate of a manner without downplaying the evil. Sidenote: this was my Book club pick – so I’m finally glad we read something worth the gas money to show up at gatherings, lmao!! Author of bestselling novel Spilled Milk: Based On A True Story and new release Pillbillies. Lover of reading, writing, journaling, running and spending tons of time with family. I love books that move me, make me think and allow powerful relationships with the characters in them. As my husband so eloquently puts it, I am 'Literally the only person he knows who will laugh out loud, gasp or cry Author of bestselling novel Spilled Milk: Based On A True Story and new release Pillbillies. Lover of reading, writing, journaling, running and spending tons of time with family.